If you read my What’s THAT in my WINE? article from last week, you know that I promised to discuss decanting wine with you this week. 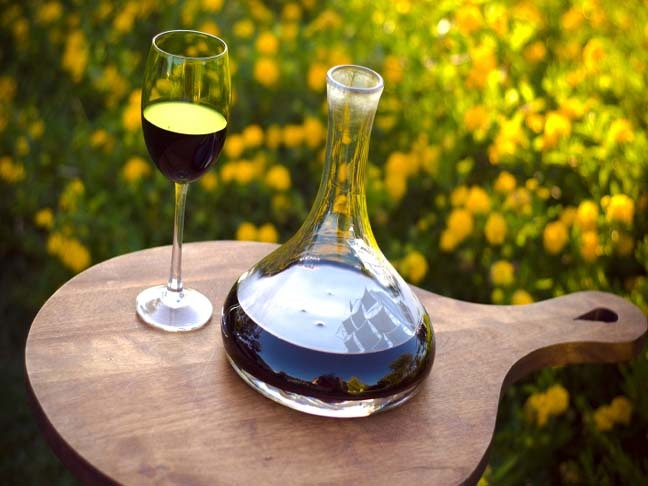 Decanting really has a very simple definition: it allows you to separate wine from any sediment in a wine bottle and also allows the wine to breathe. Uncorking a bottle of wine will only allow a small amount to come in contact with the wine. A larger surface area of the wine needs to be exposed to air in order for the wine to breathe. Exposing the wine to air begins to oxidize the wine which smooth’s out the texture and brings out more of the aromas of the wine. ~ Pour your wine from the bottle into a decanter in one long, steady stream. It’s okay and better if the wine splashes into the decanter, allowing it contact with the air. ~ If the wine is older, watch the sediment creep up as you pour the wine into the decanter and make sure to not let it flow past the shoulder of the wine bottle into the neck. Putting a candle underneath the bottle will help you see the sediment. ~ Once the wine is in the decanter, get to swirling! This will allow even more air contact with the wine. This is especially important if you are decanting a big, bold young red wine. ~ Decant older wines that have sediment in the bottom or alongside the bottle to pour the wine off of the sediment. ~ Decanting younger red wines with high tannin levels benefit from the aeration of decanting. ~ If the entire bottle of wine will not be consumed in one sitting, it is generally a good idea not to decant the wine. You want the remaining wine to stay fresh in the bottle and not be exposed to the air. ~ Bargain wines, or what I like to call supermarket wines, usually do not need to be decanted. They are made for immediate consumption and will not benefit from decanting. Which wines should I decant? 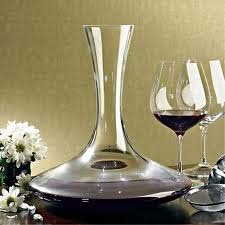 I love this basic, everyday decanter by Riedel, which can be purchased at Wine Enthusiast. 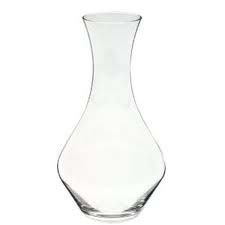 Or if you prefer a different style, this Vivid Wine Decanter is another great choice.